What’s Not To love About This Amazing City? Amsterdam is definitely in the Top 3 of my favourite cities in the world. I have been here a total of four times now, and have loved this city more each time! This city is filled with so much cultural diversity, and so much to do. From festivals, nightlife, exhibitions, museums, restaurants, bars, clubs, shopping, events, plus excursion & attraction listings. You won’t miss out on anything if you don’t want to. There is something here for everyone, 365 days a year. Cycling is probably the most fun way to explore the city. 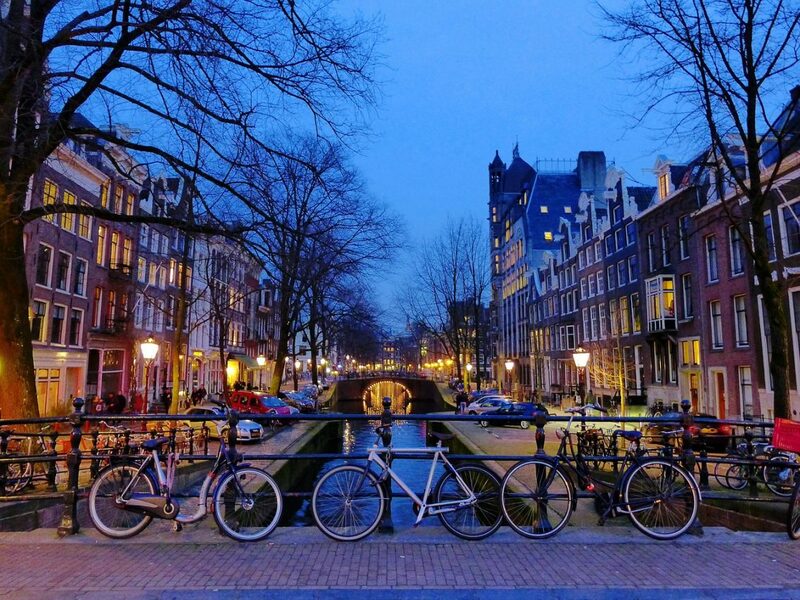 Did you know that there are roughly 800,000 bikes in Amsterdam? 63% of Amsterdammers use their bikes daily. It’s incredible. Single or tandem bikes can be rented for under 10 Euro a day. We had the option of renting bikes but though chose to get the ‘Iamsterdam City Card‘ to explore the city via public transport. The Iamsterdam City Card gives you unlimited use of buses, trams, and the metro for the duration of validity. Do not visit Amsterdam without getting this card for your trip. The amount of money you can save is unreal! Not only that, but with the card you are also given free entrance to Amsterdam’s major museums & attractions. Yup – there’s still more – a free canal cruise, a detailed city map, as well as discounts on attractions, concerts, theatre, rentals, and restaurants. Excellent value for your money with choices of 24, 48, 72, and 96 hour cards. The National Museum dedicated to Dutch Arts and History. It has been going through an almost 10-year restoration. The Rijksmuseum has at its core a Royal Collection. Approximately these almost 200 paintings and artifacts used to be displayed in The Hague in 1800. The museum is a work of art in itself and each group of paintings has helpful cards in English and other languages describing each group of paintings. A must-see in Amsterdam with Rembrandt special collection of paintings on the upper floor which you won’t want to miss. In order not to miss out on great spots in Amsterdam that are a must see, I urge you to download the GPSmyCity app free of charge. This app is great when travelling because it has travel articles from a vast range of towns and cities. Here’s my article on Amsterdam, which you can download now using this link: GPS-guided travel article – Amsterdam. You can read it whenever you want without using the internet. The best part? You will never get lost again. You can use GPS-guided travel articles two different ways, by either selecting a particular article of choice or browsing by city! The only guide you will need for your vacation. Try it out today! See the place Anne Frank went into hiding from Nazi persecution during World War II; the location where she wrote her world famous diary. For more than two years Anne Frank and her family lived in the annex of the building at Prinsengracht 263. It is generally advised to book online as the queues get pretty long, especially during high tourist season. I tell you, it’s so bad that people actually post YouTube videos about the long lines outside the Anne Frank House. If you do not book online, and do not want to wait too long, your only other option is to get there an hour or two before closing. In July and August the museum stays open until 22:00 and until 21:00 from April to June, and September to October. The heart of Amsterdam surrounded by beautiful and historic buildings. Although it is called Dam Square it is rectangular in shape. Dam Square was originally two squares: the actual dam, called Middeldam; and Plaetse. The Dam Square is just a few minutes walk from Amsterdam Centraal Station. Several times a year the square is the site of a funfair. During December, the city’s main Christmas Tree is set up at the Dam Square. To the right of the square you will find the royal palace. Brilliant architecture, with audio guides so you can wander at your own pace. The Palace is used by the Dutch Royal House, and therefore closed at times for royal events. The other sides of the square are home to lots of shops places to eat, and souvenirs for purchase. Madame Tussaud’s is located here, and the Amsterdam Dungeons are only a few minutes walk away. Street performers perform here on a regular basis – and they are extremely talented. Don’t hold back on giving them a few Euros. A Fantastic Player – Wish he would have shown his face! He was trying to raise money to get an engagement ring for his girlfriend and did not want to embarrass her! Awwwww! As a “busy bee”, how can I not mention “De Bijenkorf” (literally, “the beehive”). It is a chain of upscale department stores in the Netherlands with its flagship store on Dam Square. The largest city park in Amsterdam, and certainly the most famous park in the Netherlands. An interactive tour which shows you how beer is brewed, a lot to watch and learn, games to play, pictures to take, and for six Euros you can even order your own personalized Heineken. An enclosed courtyard dating from the early 14th century which was originally built as a sanctuary for the Begijntjes, a Catholic sisterhood. The 17th-century Protestant church is the largest of its kind in the Netherlands. Several Dutch artists are buried here. I have to mention this as it is prominent in Amsterdam, and anyone visiting would have heard about it. Hardly is Amsterdam ever mentioned, without touching on the subject of the Red Light District. The RLD has been there reputedly since the 15th century. The most famous one is a short walk from Centraal Station. Amsterdam is safe both day or night. You can take guided tours of the RLD where the tour guide explains the history of the area in great detail. Henri Willig Cheese is so delicious! Henri Willig’s cheese is sold under three different brand names: Henri Willig, Hooidammer and Polderkaas. The most well-known Henri Willig cheese is the exclusive ‘baby cheese’ in their brightly coloured packaging, such as Baby Gouda. One of the most famous and major squares in Amsterdam – named after the famous painter Rembrandt van Rijn. Rembrandtplein is one of the busiest squares in the city. 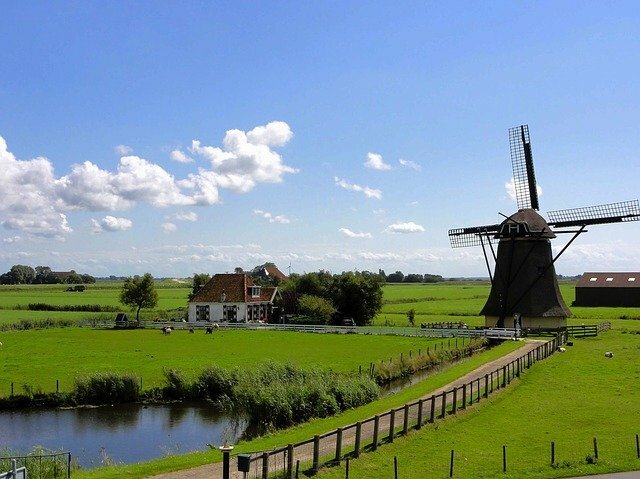 Holland is famous for its’ windmills which played a crucial role in the development of Holland. Windmills are know to create land, build ships, produce flour, oil and mustard! 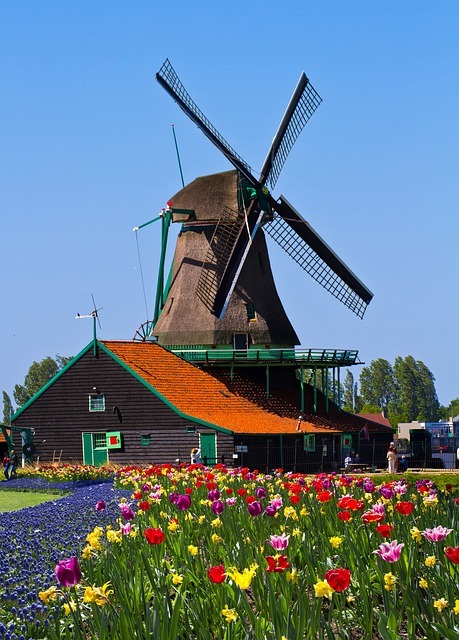 See original working windmills in action is in a little village named the Zaanse Schans, just outside of Amsterdam. Amsterdam is great, but not venturing outside of the city would mean missing out on amazing experiences and sights. From the 400-year old cheese-weighing tradition, a medieval village, the world’s largest flower garden, and even Belgium! There are plenty of train and bus connections, tourists can easily plan day trips. If you want to be really comfortable, and spontaneous, book a car with Easy Terra! This car rental comparison site compares prices from well-known car rental companies so you are guaranteed to save time and money. We went to Bruges and loved it. Bruges is a well-preserved medieval town in the northern region of Belgium surrounded by beautiful canals and old city walls. You will adore it. The ‘Netherlands’ mean “Low Country” in Dutch. About half of its surface area is less than 1 metre above sea level. Its highest point is 321 metres (1,053 ft) above sea level. The national flag of the Netherlands dates from 1572 and is also the oldest tricolour flag. Rotterdam, in South Holland, is the largest seaport in Europe. Have you ever been to Amsterdam or plan on going sometime soon? Share with me in the comments below. I have been to Amsterdam once in 2011 when I was backpacking solo through Europe. Ohh man those spice cake nobody told me that you have to wait atleast halv an hour before you could feel anything because it takes time for the body to obsorbe the substance and the cake was so good that I ended up eating three and suddently I was gone! I am happy I am over that stuff! The Anne Frank museum was very emotional as I read the diary before I arrived to Amsterdam. I visited Amsterdam many, many years ago whilst at uni – was literally a fly by visit! Would love to go back and walk along the canals, see the famous windmills and visit the museums. I didn’t know that there were 800,000 bikes in Amsterdam! The pictures here are amazing. And I love all of the windmills. I do hope to get to go there someday. Omg loverly photos!!!! I hope To visit Amsterdam one day! Looks like such a lovely city! What a lovely trip! I’d love to visit the Dam Square some day! I’ve always wanted to visit Amsterdam and now you’ve given me a lot more reasons to get there! There looks like so much to do, I need to start planning a trip there. By the way those are some great photos! I’ve wanted to go to Amsterdam for so long! I need to make a plan, for sure. Love this helpful guide and all your fab pix! Thanks for sharing. What a beautiful tour! I have never been there, but you have given me a glimpse of a beautiful city. I love the story of Anne Frank and her heroism. What a city full of legacy! Thank You for sharing! I absolutely love Madame Tussaud’s wax museum. I went to the one in Hollywood, California. Some of those wax figures are hauntingly scary. It’s so much fun to take pictures next to them. Fiona looks GREAT! Thank you so much for this. I needed this resource. I’m actually planning trips for the next year and Amsterdam is on the list. Se manifique! I love your photo journal & descriptions. I would love to visit this place haha and I know many of my friends would enjoy the heineken experience. Amsterdam is among the most beautiful destinations in the world! I went there for work few years ago but didn’t get time to explore! Hope to visit there soon again! I love Amsterdam! I have been all over Europe, growing up in Germany with a family who insisted on going just about everywhere at least twice a year! Amsterdam is my favorite city in Northern Europe by far, very beautiful with its own charm. You have captured it nicely, blessings! Great post! I have been to Amsterdam this summer and I loved so much !! I was praying to lose the flight so we can explore more :). The museum of bags and purses is a museum I think you will like. And definitely some dutch pancakes with spinach and cheese. Yammi. I literally know nothing about Amsterdam so this post was very enlightening to me. I love learning about other parts of the world. I wish I could travel out of the country more. Your pictures are wonderful and capture Amsterdam beautifully. It is such a colourful place with so much to do and such diversity. I love Amsterdam even we have not met yet. And now after seeing your photos, it makes me love her more. Oh my…. i hate this long distance love affair. I love Amsterdam to pieces! I was humbled by the Anne Frank House, loved the Heineken experience, the flower shop was a colourful and beautiful tulip frenzy and the canals and bikes gave it incredible character. I hope to get back there someday! I think I will be back there next year. If you are heading in this direction, we should do an Amsterdam Bloggers meet up. Hi I never really knew much about Amsterdam except for the ability to smoke marijuana in cafes. I am not a smoker but that’s always what sparked a conversation pertaining to the area in my community. I would love to add this on my list and discover a more authentic version of the city (by bike of course). I’d love to visit the Anne Frank house, that would be such a fascinating piece of history to see in person. Amsterdam sounds like heaps of fun! I have a couple of friends from there and would love to see their home city. Sounds like such a vibrant place too. I think you would enjoy the experience Juliette. This liberal city offers so much in terms of history and culture. It is a lot of fun and you would always want to return there. I was in Amsterdam on a short layover and I feel like I left my heart there! I really want to go back to explore more of this diverse city. Thanks for sharing! How fun to ride bikes around, sampling cheese between museums. That is my kind of city! Plus boats! We had a really bad first impression of Amsterdam. The first time we were discriminated against in our entire lives was by a school in Amsterdam as we were walking to our hotel. A bunch of kids started yelling at us to “Go back to China”. Dafuq? We ain’t even from China lol, crazy fools. Other than that, we really enjoyed Amsterdam though! The food there is surprisingly good and YESS to all the cheese! So good. I do love Amsterdam too, it feels like everyone respects each other but at the same time you are free to dress as you wish, behave as you like (of course without causing any troubles), etc. It’s the image of the dreamt “freedom land”, I absolutely love it. I loved Amsterdam heaps! Your suggestions are spot on and I feel so humbled and privileged to have visited Anne Frank’s House. I hope to get there again someday! The clogs are very flattering on you! LOL, thanks for the Clog compliments…..they were slightly on the big side, but still so cute! I would love to be able to visit Anne Frank’s home. I bet that was very interesting. And who knew the Dutch were so tall? Thanks for sharing! I love that you can bike everywhere. They just don’t build architecture like there. It’s beautiful. Oh, I know a good resource if I ever travel to Amsterdam. 🙂 Thanks for sharing. You are so welcome. Thank you for stopping by to read. I never thought of going to Amsterdam but after reading your post I’m tempted to book a weekend gateway. It was fun learning the facts about the country. I never knew that Dutch people are the tallest in the world. Looks wonderful in the netherlands. I couldn’t picture myself being here. Love the boat it would be a nice ride. A girl can DREAM! Wooooow! Amsterdam is soooo beautiful. I love to feel the ambiance of this country. The architecture is soooo amazing! I also absolutely love Amsterdam! I actually really want to live there for a few years. There’s just so much to do + its so easy to get around. The canals are also just beautiful. I’m hoping to a graduate program at the University of Amsterdam next year. Just reading through this post makes me so excited thinking about next year. How is the student life in general? Thanks for writing such an easy to follow mini guide to Amsterdam! It looks absolutely wonderful. It really is Sarah, if you ever head over there, please let me know if you enjoyed it. I had no idea about the gin, thanks for that! Amsterdam is also one of my favorite cities, and I’d love to go back (every month if possible). I loved that a lot of places are easy to walk to from the train station and the canal tour was amazing. I totally agree with you Alina! If I could go there once a month for a long weekend I certainly would. Especially at times of the year when they hold special events and festivals. Do you live close to The Netherlands? Epepa – I hope you make it to Amsterdam soon. If you already love bike riding,t hen this would be a great way for you to explore the city and really enjoy the ins and out and see the things that most tourists may not be looking out for. Man, why didn’t I go to the Heineken experience when I was in Amsterdam?? I didn’t even know it existed! I thought the Anne Frank House Museum was extremely well done and moving. I would even go back if I visit Amsterdam again. I’ll be visiting Amsterdam for 3 weeks in May, and I very much enjoyed reading this article to get an idea of things to do! Visiting the windmills is definitely a priority of mine. I’m a dutchie myself, and I can’t wait to learn more about my heritage while I’m there! And I certainly agree that dutchies are the tallest in the world (I am 5’9″ and my father is 6’6″!). I am glad that this post is able to help you on your upcoming trip. You will find so much to do and see and I believe you will have a great time. There are also a lot of places to learn about Dutch History which will certainly be a plus point for you. When I visited Amsterdam I loved the floating flower market? Did you visit this to? I also went to the Van Gogh Museum which was pretty special. I wish now that I had visited Ann Frank’s house – I’ll have to go back now! Beautiful place! I have never been to Netherlands, and has always wanted to head there! Thanks for sharing about the country! Love the small tidbit about gin 🙂 who knew? I love Amsterdam as well, it’s one of the best cities in Europe. I’d love to go back someday soon. I am obsessed with Amsterdam for some reason and your post makes me more antsy to visit. I am hoping to get there in the summer so I can see the tulips in full bloom! I love that you have a few visits under you belt for this post. After several visits, it sounds like you have really explored and sharing a Best Of travel tips. I really want to visit Amsterdam someday. It seems like such a lovely place and it looks like you had a great time there. Someday . . . with my kids! Your guide is great! It’s a shame, but I haven’t explored Amsterdam when I visited it. I was all into parties, but when I visit it next time I will definitely check out the sights you have listed and I would love to ride a bicycle as well. Never been to Amsterdam but it’s on my wish-list. Your pictures are so vibrant I love them! Amsterdam is on my list ever since I bumped into someone from Netherlands, in the Himalayas in India. Thank you for the post, it strengthens the resolve. Would love to explore the local culture, and the way of life.